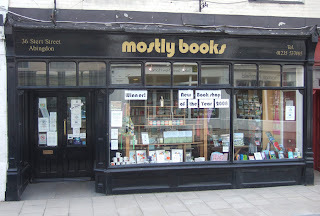 Mostly Books bookshop in Abingdon : Come see our nibbie! 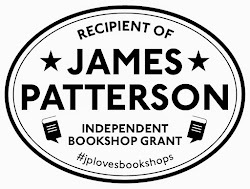 Having got back to the bookshop yesterday lunchtime, we entered triumphantly to balloons, banners and congratulations from Alison, Julia and Karen in the shop (thanks guys!) - and then it was back to work. The broadband and phone were out. So after spending an hour grovelling around under the counter fixing that, I was all set to write-up the blog yesterday evening but...on popping down to the shop, I found a full-scale ant invasion at the back of the shop and spent two hours sorting that out. Obviously the bookselling gods were a little concerned that some hubris was setting in. I duly sacrificed a Jeffrey Archer paperback on a small altar in the courtyard garden, and things seem to be resolved on the connectivity/infestation front. It was certainly an effective way to be brought back down to earth after an incredible 24 hours. It was bookgroup tonight. The Thursday evening group was the first one we started just after we opened, and amongst those discussing the current book (Sharon Dogar's Waves) were members who have been with us since the first meeting. It was particularly nice to pass the nibbie around to show them, because they are as much a part of the shop as we are. I'm sure many of our customers will feel that this award is partly theirs - and they'd be right. So anyway, it has been some 48 hours. For everyone who has sent messages of congratulations, sorry we haven't been responding. Normal service resumes tomorrow (hopefully). Before that, and in response to requests for photos, here's a heavily edited version of what happened when we went down to Brighton. We arrived early in the afternoon - I'd never been to Brighton before, but Nicki has a bit of 'previous' where Brighton is concerned, so we headed for The Lanes and the Bath Arms for a nice pint sitting outside. 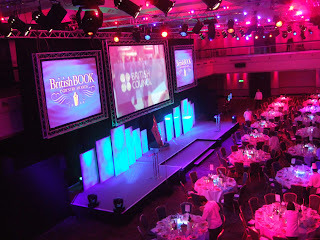 We genuinely didn't expect to win (this isn't just false modesty - we just thought Mr B's was the hot favourite, which actually proved to be spot on but for different reasons), so we were reasonably relaxed - at that point. By now the nerves were well and truly jangling. 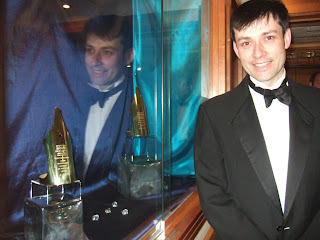 It was only when I saw the award board that I started getting sweaty palms, and believing we were in with a shout. We were sitting on a table with members of the Bookselling Association (BA), as well as Lyn and Mike, fellow shortlistees from Bookstór in Kinsale, Co. Cork. They were a total delight to chat to for the evening, we swapped loads of tips and stories, and Nicki and I sincerely hope we can make it over to what sounds a beautiful part of the West Coast of Ireland to see their shop. Thanks for the lovely comment you left on the blog yesterday as well. And we'd won. Shock, tears, an embarrassingly long trek to the front whilst being flimed, trying with only partial success to squeeze through all the chairs and tables blocking our way. What happened next was a bit of a blur as you can imagine. 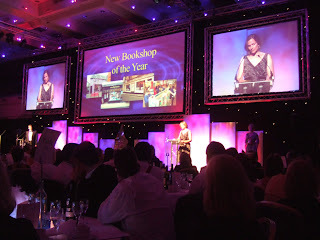 We made our way up to the podium, I thanked family and friends, our wonderful customers, and - sincerely - all the help and support we had received from the book trade since we opened, without which we wouldn't have received the award. I believe I singled out Anna Dreda at Wenlock Books and Matthew & Adam at Crockatt & Powell for special mention - difficult to remember exactly. 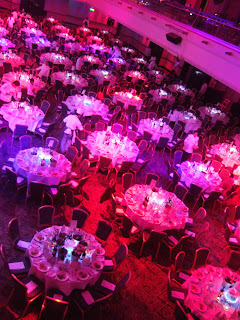 Then we were whisked round the back for a photoshoot with Meryl Halls of the BA (who is completely lovely and, with the marvellous benefit of hindsight, chaperoned us brilliantly for the evening). You can see this photo here (I'm the one looking like an extra from a George Romero film). I'm afraid for the rest of the evening - for obvious reasons - the picture taking went out of the window. 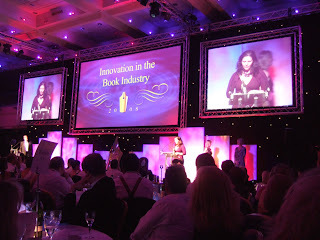 I did, however, manage to get a picture of Emma from Snowbooks receiving her innovation award - she recollects her acceptance speech very well over on Snowblog. 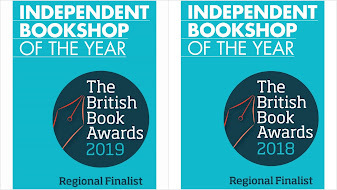 We were also - finally - able to meet Nic, Juliette and Caroline - the illustrious team at Mr B's as they scooped Independent Bookshop of the Year. 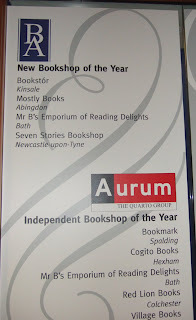 When we got back to the shop we hastily placed the award in the shop window. This is Nic et al. from Mr B's just to say well done again on your Nibbie and thanks for the kind mentions in the blog. It was great to meet you both at last as well on that hot and bizarro night in Brighton. 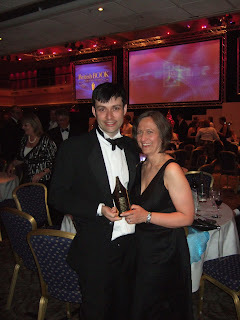 Good luck with making the most of the award and see you again soon! You must have had a large number of visitors to your blog after the event because I saw an after ripple on mine. Well done. KUTGW. Brilliant stuff guys - well done.